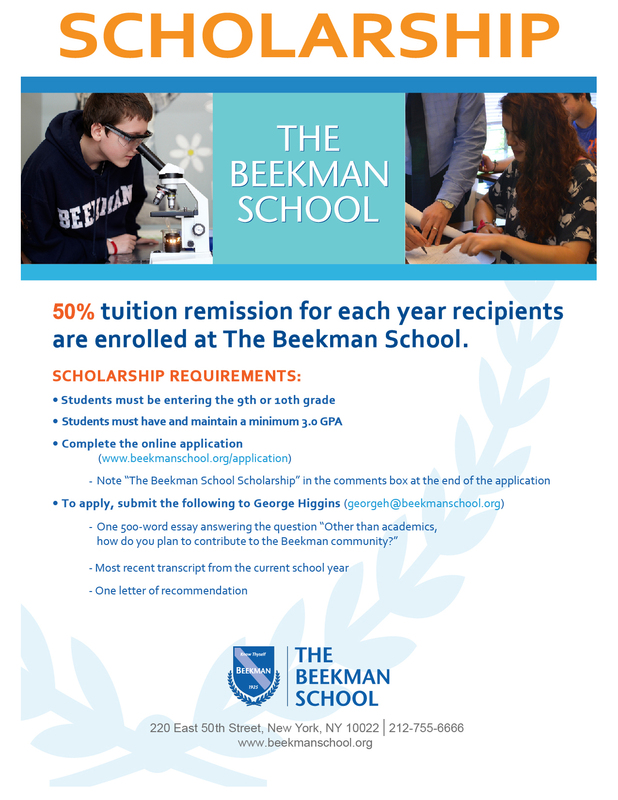 The scholarship is designed to provide an opportunity for students to attend The Beekman School who may not have been able to do so otherwise. All new, incoming 9th and 10th grade students who earn a minimum 3.0 GPA during the current school year are eligible to apply. Potential candidates must be full-time for the full academic year and must be U.S. citizens. Finalists and their parents will be contacted with regards to setting up an interview at the school as part of the application process for all prospective Beekman students and families. In addition to the standard admissions interview, finalists will discuss their essay, letter of recommendation and other award areas. Please reference this downloadable PDF (right click to save) announcing the award for a summary of the above information or to share with anyone who may be interested in applying. For more information regarding the financial benefits of the award, please reference this Q&A section.